Register today and get reduced shipping and much more! 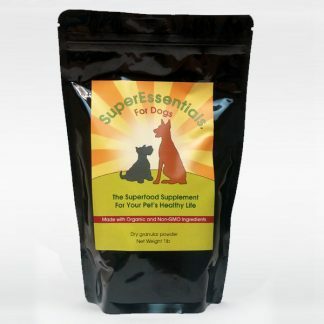 SuperEssentials™; for Dogs was developed under the guidance and advice of holistic veterinarians who understand that most of our pets could use a natural health supplement to help them achieve optimal health. Most of our pets do not receive everything they need for optimal health in their diet of highly processed commercial pet food. Even the most expensive and ‘natural’ pet food, with seemingly great ingredients had to go through a great deal of cooking, rendering and sterilizing. That is why some pet owners choose to buy raw meat products for their pets, or make their own pet food at home. But even then our natural health supplement can be really beneficial. 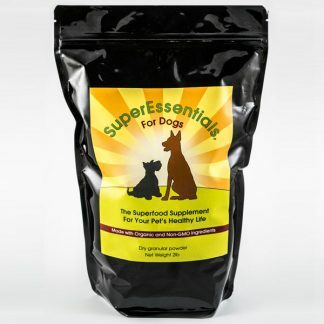 Our SuperEssentials™; for Dogs is therefore a wonderful addition to help support a healthy life for your pet. 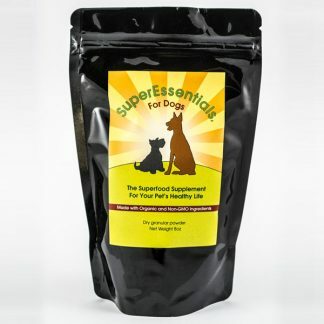 SuperEssentials™; is unlike traditional health supplements, in that it is not made from synthetic or isolated ingredients but contains only wholesome and whole dried plants. It contains a balanced selection of all-natural, unprocessed human-grade quality ingredients. 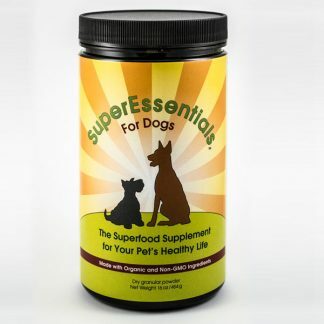 What is the difference between SuperEssentials™ for Dogs and other supplements? We use only certified organic and non-GMO ingredients and our formula contains natural ingredients of the highest quality and none of the cheap and inferior fillers! We do NOT include ground flax seeds in our formula because flax seed oil is one of the most unstable oils in nature. In a matter of just a few hours of being exposed to oxygen and light it will turn rancid. Our formula contains Chia seeds that have a stable shelf life of at least three years.